Bellmawr, NJ, July 16, 2015: American Autowire is the premier automotive electrical manufacturer for Street Rod, Muscle and Classic Cars. All new fully sealed 22 circuit fuse box with circuitry that is proprietary to American Autowire is rated at 200 amps. Features 8 optional accessory circuits. Electronic Flasher for use with LED turn signals. New 200 amp sealed manually resettable circuit breaker offers complete system protection, as well as providing the ability to shut the power to the system off in the event that repairs are necessary. Main harness come pre-terminated at one end in fully sealed connectors with over 200” of tough heat resistant GXL wire with the primary functions printed every 2” for easy installation and diagnoses. Power harness comes pre-terminated at one end in fully sealed connectors with over 100” of tough heat resistant GXL wire. The accessory kit includes a sealed connector that plugs into the fuse box in the optional outlet. It includes seals and terminals with 4×400” of 18, 16, 14, and 12 gauge wire in different colors for all of your additional power requirements. Instrument Cluster wiring is designed with a “cluster harness disconnect” system for easy service and assembly. The system will also connect into most popular aftermarket gauges such as DAKOTA DIGITAL, CLASSIC INSTRUMENTS, AUTOMETER, VDO, and others. Subkits for connecting turn signals, headlights, tail lights, parking lights, brake lights, gauges, third brake light, license plate light, and basic engine functions and sensors included. All subkits are pre-terminated at one end and provide long lengths of tough heat resistant GXL wire with the function of each wire printed every 2”. A 30 amp headlight switch and dimmer switch are provided for your convenience. Connections for these switches come pre-terminated to make installation faster if you choose to use these switches. 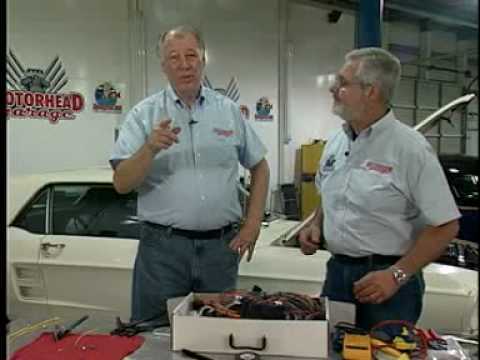 Engine wiring includes feeds for coil, tach, water temperature, oil pressure, electric choke, transfer case warning lamp, under hood lamp, transmission kickdown, and electric speedometer (if needed)..
Front lighting includes extra long leads. All head light, parking light, directional light, and side marker light leads, along with horn. This Severe Duty Universal Kit is part number 510564.